Schedule 40 pipe, 1" - 2"
Schedule 30 pipe, 1" - 2"
Schedule 10 pipe, 1 ¼" - 6"
Schedule 7 pipe, 1 ½" - 4"
Schedule 40 galvanized pipe, 1" - 2"
Schedule 10 galvanized pipe, 1 ¼" - 6"
As of 2002, all of our non-galvanized products have a continuous color coded stencil. 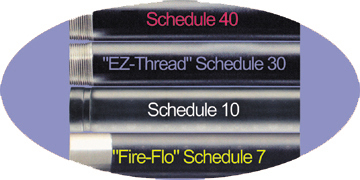 Each schedule has a different color to assist in product identification. Standard lengths are kept in inventory ready for immediate shipment. Youngstown Tube also manufactures custom lengths (18'-25') with plain or grooved ends (minimum quantities required). run the product you are looking for, call. UL, CUL and FM approved.